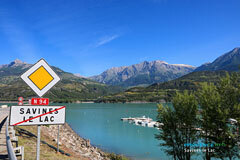 Departement of the Hautes Alpes - Serre Poncon lake - Population : 866 inh. 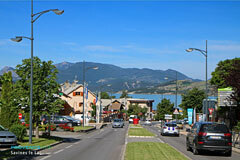 - Altitude : 800 m.
On the RN 94road, between Gap (29km) and Embrun (10km) along the shores of Serre Ponçon lake. 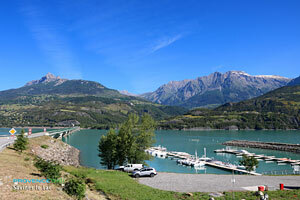 At the edge of the Ecrins National Park, and surrounded by high peaks (Le Morgon, Aiguilles de Chabrières and Mont Guillaume), Savines le Lac deserves its title of "green holiday resort". 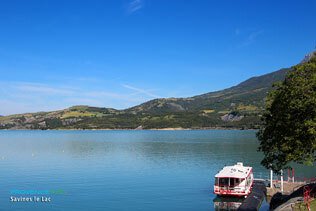 When Serre-Ponçon lake, was created, the rising waters eventually covered the old village of Savines, and so in the 1960's Savines le Lac was built. 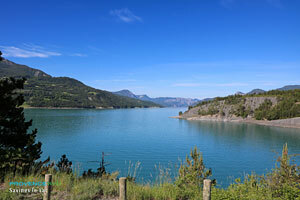 It is a smart agreeable village situated close to the lake, pleasantly exposed due south ( 300 days of sunshine per year!). 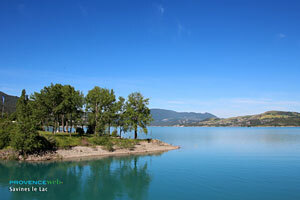 Here you will find several piers catering for the numerous water sports available on Serre-Ponçon lake, all the necessary shops and numerous café terraces looking out over the lake, carefully tended lawns, a pretty square with a water jet in the middle, from where you will have a perfect view of a fine white church built very much in the "sixties" style ! High mountain races (Ecrins National Park). In winter, skiing nearby (10 km from Réallon and 20 km from les Orres). 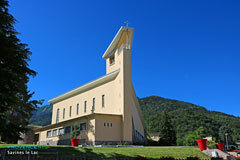 Pontis (7km) and Embrun (10km).